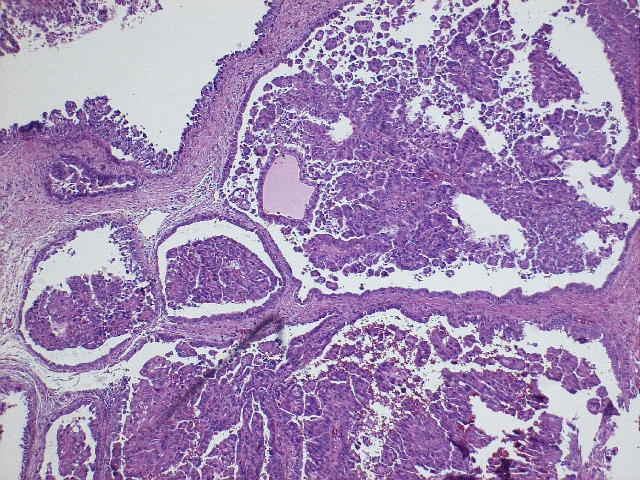 To subscribe or unsubscribe, email info@PathologyOutlines.com, indicating subscribe or unsubscribe to Case of the Week.� We do not sell, share or use your email address for any other purpose.� We also have a biweekly email of new Pathologist jobs added to our Jobs pages, a biweekly email of new Laboratory jobs added to our Jobs pages, and a monthly email of news about the website.� You must subscribe or unsubscribe separately to these email lists. 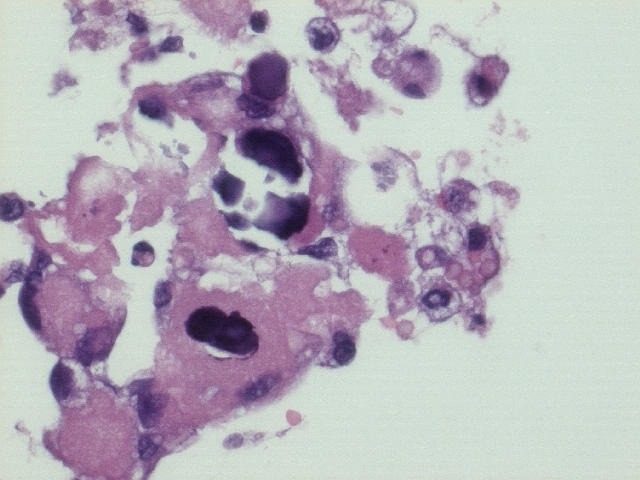 We just added two new Email lists - to receive a list of new pathology books once a month and to receive our newsletter twice a year.� The new books email will list new books added to our books pages with links to more information.� It will also describe book discounts.� To subscribe, email info@pathologyoutlines.com with �subscribe to books email� in the subject line.� Our newsletter will be sent out by email or regular mail, initially twice a year, and will contain descriptions of website features, tips and other helpful information.� To subscribe, email info@pathologyoutlines.com with either �subscribe to newsletter by email� or �subscribe to newsletter by regular mail�.� For the latter, please include a mailing address. 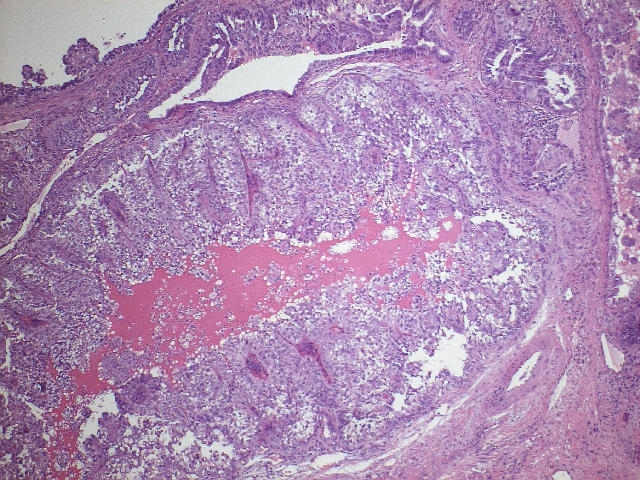 At pelvic ultrasound, the urologist reported that he could not identify the prostate, which was apparently obliterated by a neoplastic process.� �He obtained blind core biopsies for frozen section to determine if he was in or near the prostate.� An enlarged femoral lymph node was also excised and sent for frozen section. 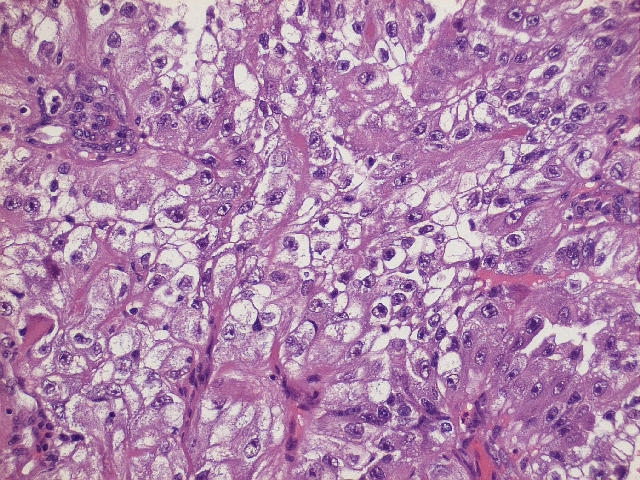 The tumor cells in the published case were immunoreactive for pan-cytokeratin, low molecular weight cytokeratin and EMA, and focally positive for high molecular weight keratin (34betaE12).� They were negative for PSA and PAP.� The patient in the published case had an elevated serum CA125, but normal serum PSA and CEA. 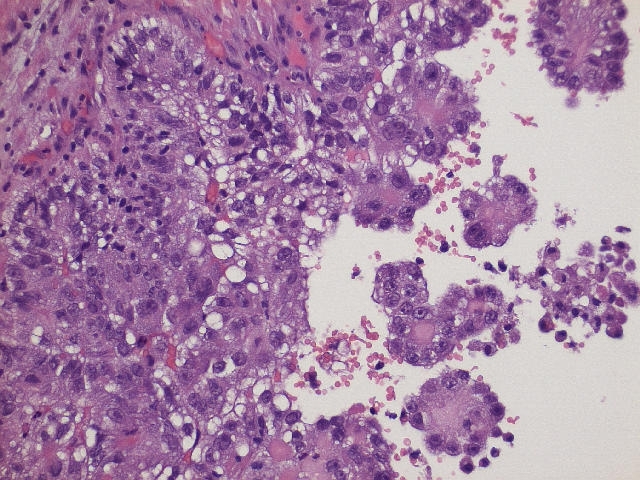 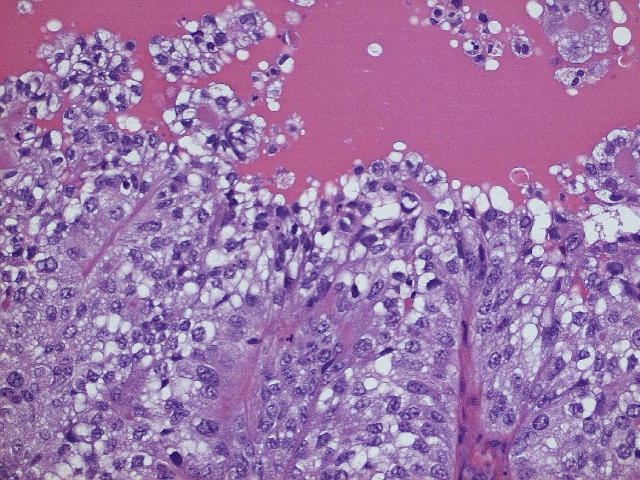 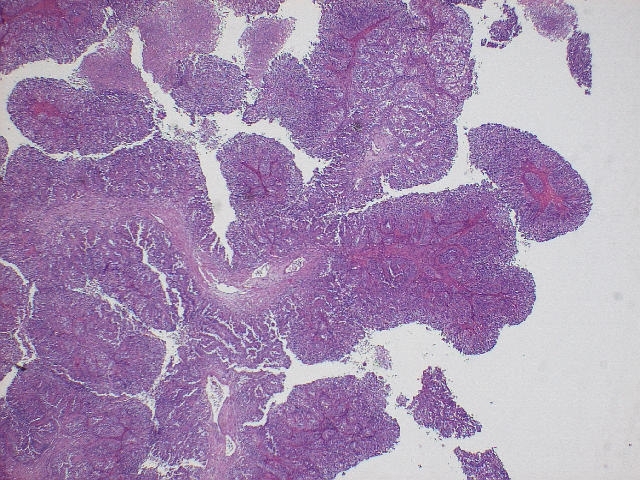 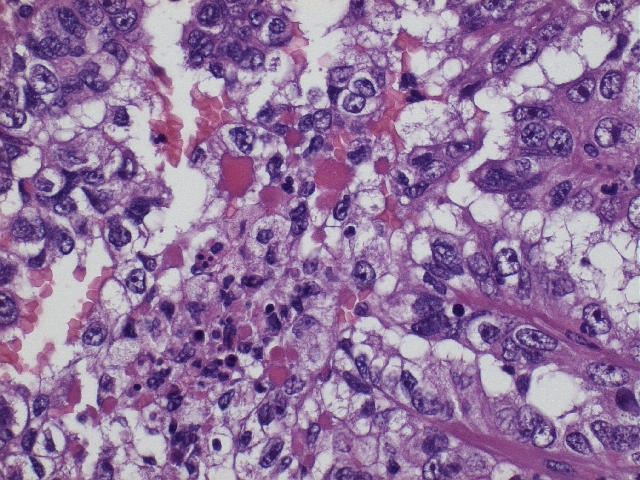 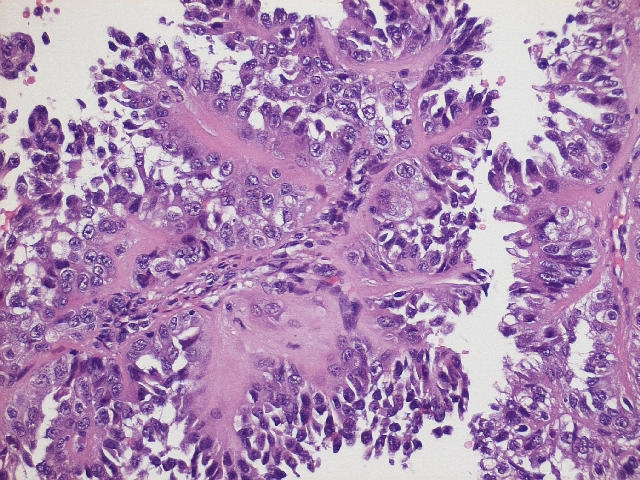 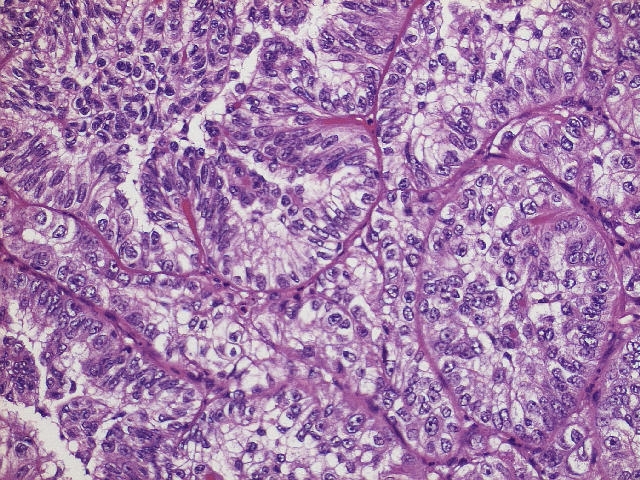 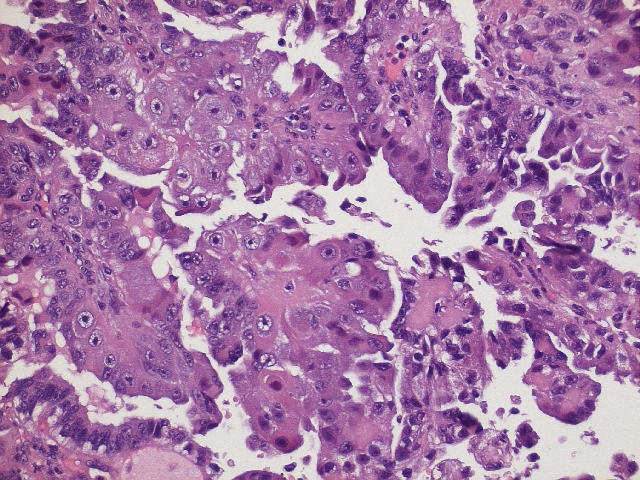 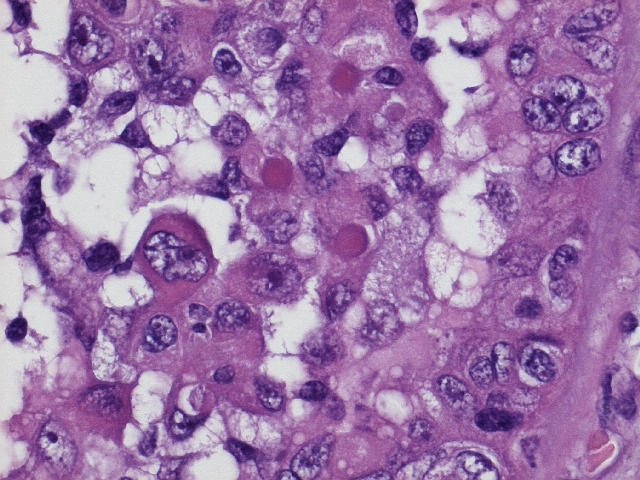 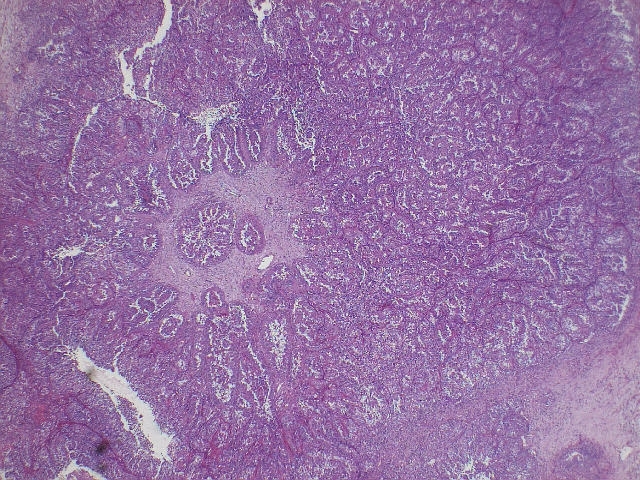 The differential diagnosis is limited.� Some prostatic ductal carcinomas or Gleason pattern 4 adenocarcinomas have focal papillary formation.� However, there are no tubulocystic or papillary structures lined by clear or hobnail cells.� These tumors also have the usual staining pattern of PSA+, PAP+ for prostatic adenocarcinoma.� Other clear cell tumors include nephrogenic adenoma (Hum Path 1994;25:390), clear cell urothelial carcinoma and metastatic renal cell carcinoma.